When people begin disappearing from the slums of an Indian city under mysterious circumstances a young girl turns to the Mystery Agency for help. Does an old soothsayer have something to do with the ghostly apparitions that have stated to appear? You must investigate these disappearances and find a magical talisman. However you are not the only one searching-as a sketchy crime boss also has designs on this ancient artifact. 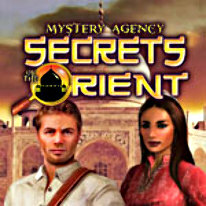 Embark on a dangerous adventure as you gather clues to solve this supernatural hidden object mystery in MYSTERY AGENCY SECRETS OF THE ORIENT!